This 4003 has spent its life in Viet Nam, where its owner and his wife teach at a school for diplomats' children. Originally Jetglo, this instrument suffered from the "sticky finish" problem that affects many instruments made in 2006. The original finish stripped without much effort--the paint and clear coat mostly came off in large shavings, with a bit of hand-sanding necessary to remove the sealer and a bit of JG paint that was left in nooks and crannies. 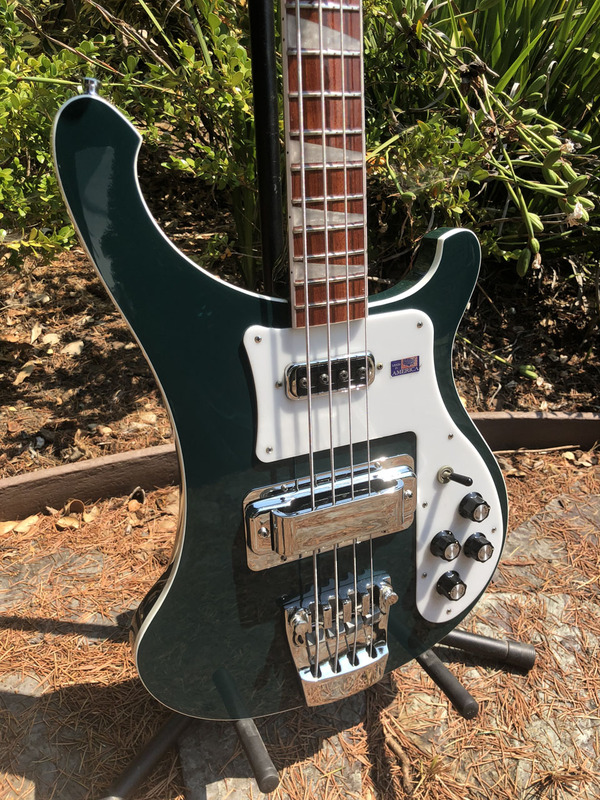 The body was re-sealed, sanded, the fretboard was masked and it was given several coats of solid (non-metallic) British Racing Green urethane that was custom-mixed by Studio California. Once the binding was scraped and detailed, several double coats of special clear coat varnish were sprayed, and then began a day of wet sanding and careful machine- and hand-buffing. Another half-day or so to assemble and set up, a few minutes of play-testing, and it was pronounced "better than new". The bass is back with its very pleased owner, in his home in Ho Chi Minh City.